The Frisco Roughriders embark on their first road trip of the 2017 season Tuesday afternoon. However, through Friday, April 14, there will still be a baseball-related attraction south of Dr. Pepper Ballpark as the Baseball Hall of Fame’s traveling exhibit remains in town through the end of the week. 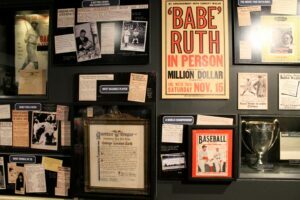 This exhibit, which features historical artifacts and several virtual reality stations, allows baseball fans to see some very cool things they might normally have to trek up to Cooperstown, New York, to the actual Hall of Fame to see in person. In this impressive display, local baseball fans will enjoy seeing the cap former Ranger great Nolan Ryan wore when he pitched his fifth career no-hitter for the Houston Astros. 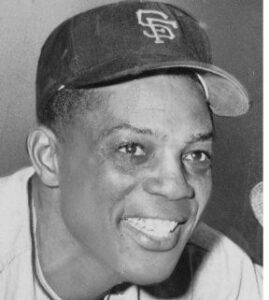 Some of the other notable artifacts include a pair of glasses once worn by iconic former Cubs broadcaster Harry Caray, a Philadelphia A’s jersey worn by Ty Cobb, and cleats once worn by Cool Papa Bell. 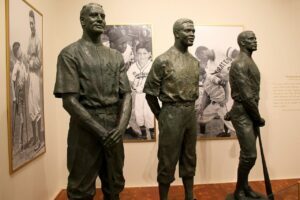 Patrons can also see the interactive Hall of Fame exhibit, where they can find the plaque of their favorite Cooperstown inductee, find out how many players from their favorite team or home state have made it into baseball’s hallowed halls, or even create their own Hall of Fame plaque with their own picture. Another cool station allows visitors to insert their own photo into iconic baseball moments like Carlton Fisk’s unforgettable home run in the 1975 World Series or the famous pine tar incident featuring George Brett and the Kansas City Royals in 1984. Touring the country for the rest of 2017 and stopping at various minor-league ballparks, this exhibit isn’t all about historical artifacts. Virtual reality is also a big player here. In one VR station, visitors are taken back to the highly-memorable 2016 World Series, where fans are on the field for pregame introductions, in the stands during big moments in the Fall Classic, and finally atop one of the tour buses the Cubs rode around Chicago in during their victory parade which was attended by millions in the Windy City. The second VR station allows visitors to swing a bat, a virtual bat, and compete in their own home run derby. Visitors not only get to pick which current big-league slugger they will be, but they also get to pick which bat they will use, and which ballpark they will hit in. But the Hall Of Fame traveling exhibit still has one additional attraction which is worth a gander and that is its own IMAX theatre. In this cozy setting which seats about 100 patrons, visitors are treated to a 12-minute film, “We Are Baseball,” which shows the past, present, and future of our national pastime. Fans who want a souvenir or two to document their experience at the traveling exhibit won’t be disappointed as there is a full souvenir trailer on site where visitors can purchase anything from pennants to baseballs and replica Hall of Fame plaques. The Roughriders’ first home game of the season might now be in the books, but there is still baseball in Frisco through the end of this week… Don’t miss the Baseball Hall of Fame traveling exhibit.